When the urge to binge is overwhelming.. It started as a little itch - a teeny, tiny scratch of a thought that just popped into your mind. You felt confused by it. Things with food had seemed to be going so much better, and you were feeling strong and resolute. But the pesky thoughts keep coming and so frequently too. Chocolate, crisps, cakes, pizza, chips.... your mind keeps wandering back to thinking about them. You consider the absolute pleasure of devouring these delicious foods. The thought of a few minutes of just abandoned eating, with no rules or restraints. The urge to binge is building like a crescendo within you and you don’t know how you can resist. Bingeing is almost always preceded by a period of restrictive eating. This might involve: counting calories; avoiding certain food groups; eating only ‘clean’ foods; or going for long periods without eating. It might also involve drinking copious amounts of diet coke or chewing gum to replace eating. Restrictive eating can work for hours, and sometimes days, and even for weeks at a time. However, one day the bubble will burst and your body will rebel, simply because you are fighting against your body’s natural physiology. It is hungry! The only way to stop this is to slowly relax your dietary rules. To begin with, this will feel terrifying and you will fear overeating. Therefore, this needs to be done one food at a time and in a controlled way. Eg: allowing in a piece of cake at lunchtime; including carbohydrates at dinner; reducing your diet coke intake gradually. After eating, you might need to employ distraction techniques or make sure that you get away from food, to allow the urge to binge to subside. In time, the more you allow in your previously forbidden foods, you will notice that the urge to binge will actually go away. Experiencing difficult emotions can also be a binge trigger. Binge eating can offer an escape from feeling an emotion; a distraction or a way of self-soothing. When you are already hungry, and then you experience strong emotion, the urge to binge can be tremendously intense. So do try and avoid over hunger! Begin to recognise your emotional triggers for bingeing. You could write a diary recording your mood to gain awareness to help with this. You could also think about other ways of coping, rather than turning to food. 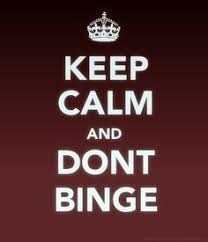 Managing the urge to binge can be very hard at first, but it is something that can be worked on and overcome. You might need to seek out some support to manage this. Don’t be afraid to ask for help.